The connection may not be obvious, until you think about it. A good still life set up has a lot in common with a good landscape composition. They each have a foreground, mid ground, and background. In the still life though, it’s most often the mid ground that has the starring role, while in a landscape it can be any of the three depths. Both types of paintings are enhanced by variety in shapes and size throughout the composition. 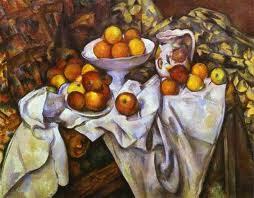 The painting posted here is one by Cezanne. You can sense how he set up the table cloth like foreground foothills leading up to the mid ground of fruit and the final backcloth like a mountain behind it all. We are exploring this concept in the current Fruit Flowers and Crystal class. This type of creative thinking can make arranging a still life set up lots of fun.